Bounce Your Way Into Shape! 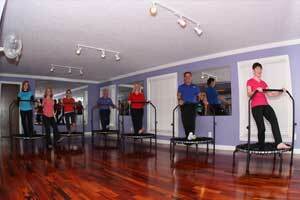 Bounce-alot-eze is a program designed by combining pilates and rebounding. Our classes include pilates stretches and exercises with an invigorating cardio session…you get the best of both worlds! Rebounding specifically works to stimulate your body’s internal cleansing mechanism, The Lymphatic System. The Lymphatic system, which is part of our immune system, is the “garbage collector of the body.” Jogging and rebounding are the only exercises that stimulate the lymphatic pump to eliminate and flush toxins from the body. This system is so important that rebounding is recommended specifically for liver cancer patients. Rebounding also uses instability to work our legs and core muscles, and has been shown to improve circulation, expand lung capacity, lower cholesterol levels, and improve balance.